It was one of the most disturbing but iconic photographs of the Vietnam War. Long before the virtual world made such things even conceivable, it was an image that quickly went viral, via newspapers and magazines. Perceptions of the conflict were never quite the same again. 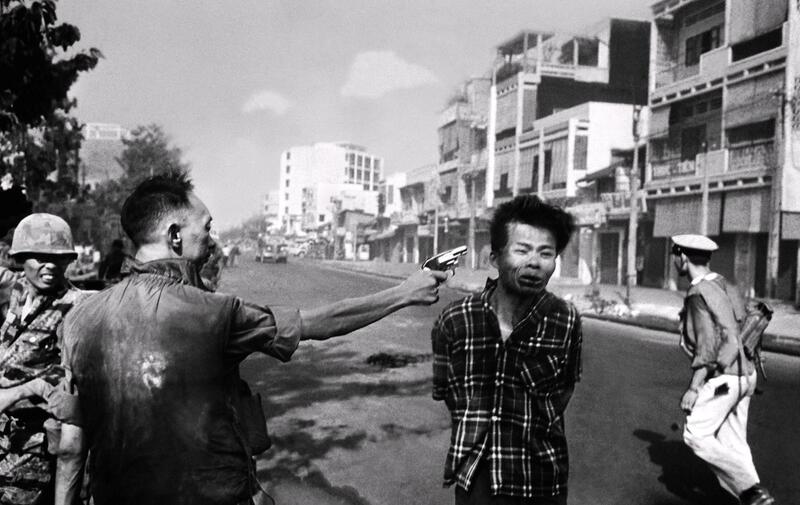 This if of course Eddie Adams‘ ‘Saigon Execution’, taken on 1st Feb 1968. It won Adams a Pulitzer Prize. But he would live to regret ever having taken it. Of course, like any single image, it can’t offer the viewer a sense of context, passing time or consequences. So inevitably, the camera only tells a half truth. At first sight, it looks like a helpless civilian brutally executed on the streets of Saigon by a callous, cold-hearted soldier. It certainly provided grist to the mill for opponents of the war and offered an easy propaganda coup to the Viet Cong. But it wasn’t as simple as all that (is anything?). The man being shot was in fact a very influential Viet Cong operator, a man called Bay Lap, who led a very successful assassination squad. He’d killed policemen and indeed had his sights on the man who shot him – General Nguyen Ngoc Loan. Not long before being caught, Bay Lap had killed members of a family close to the general. So it’s all messy and terrible. A murky mixture of revenge, kangaroo justice, and combat. War, in other words. But I couldn’t help think about this picture when looking at some remarkable images taken during another war – this time, the Second World War, back on the home front in the USA. I’d not heard of the photographer before, Esther Bubley – but I found that every single one in her collection seemed to exemplify everything that is best about the medium. They are evocative, poignant and atmospheric. One has a sense of time and context (even if we’ll never really know how reflective they were). Its title is simple enough: ‘Watching Woodrow Wilson High School cadets, Washington, October 1943‘. 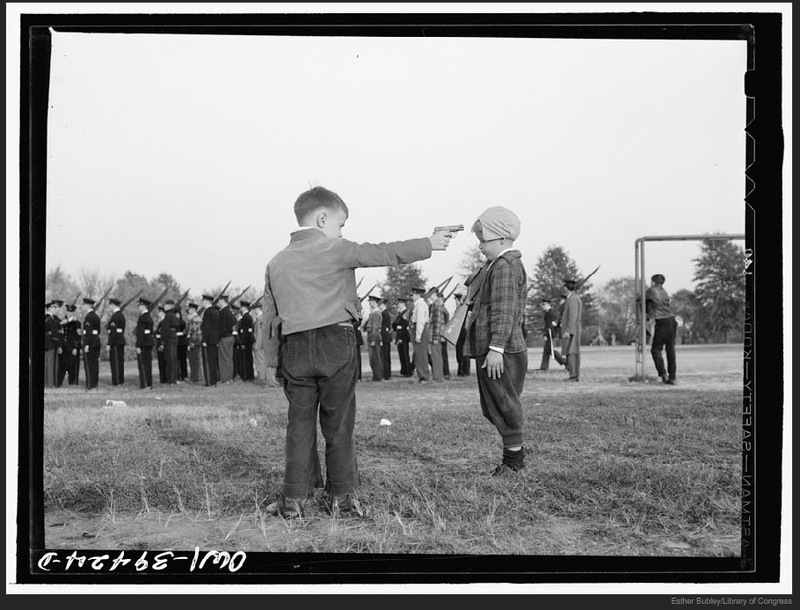 Two boys play soldiers in a field, too young to join their older brothers and cousins going through cadet drill in the middle distance. No doubt the cadets will soon be old enough to be ferried across the oceans to the European or Asian theatres of war. But these two, like almost every boy in history, play at what the grown ups do. Of course, if you look closely, you might detect that things are not quite as they would seem. The ‘victim’ seems to stand a metre or two further back from the gunslinger. So perhaps he’s not aiming directly for his head. But even if not, we wouldn’t be surprised if he was. Boys will be boys… A game of dare, perhaps? Pictures will always tell the story better than words. Wow–reading essays by Susan Sontag now. She says “one never understands anything from a photograph… the camera’s rendering of reality always hides more than it discloses.” I think I agree. and it’s interesting to compare to the word. You may have heard the statement, ‘a picture is worth a thousand words.’ Don’t you believe it. Consider, for instance, Hamlet’s great soliloquy that begins with ‘To be or not to be’, the poetic consideration of the pros and cons of suicide. It is 260 words long. Can you get across the essence of Hamlet’s thoughts in a quarter of a picture – or for that matter, in 260 pictures? Of course not. Thanks for suggesting this connection between Eddie Adams’ photo and Esther Bubley’s. Her photograph was added here.